Abstract: Recently, iron oxide nanoparticles (NPs) have attracted much consideration due to their unique properties, such as superparamagnetism, surface-to-volume ratio, greater surface area, and easy separation methodology. Various physical, chemical, and biological methods have been adopted to synthesize magnetic NPs with suitable surface chemistry. This review summarizes the methods for the preparation of iron oxide NPs, size and morphology control, and magnetic properties with recent bioengineering, commercial, and industrial applications. Iron oxides exhibit great potential in the fields of life sciences such as biomedicine, agriculture, and environment. 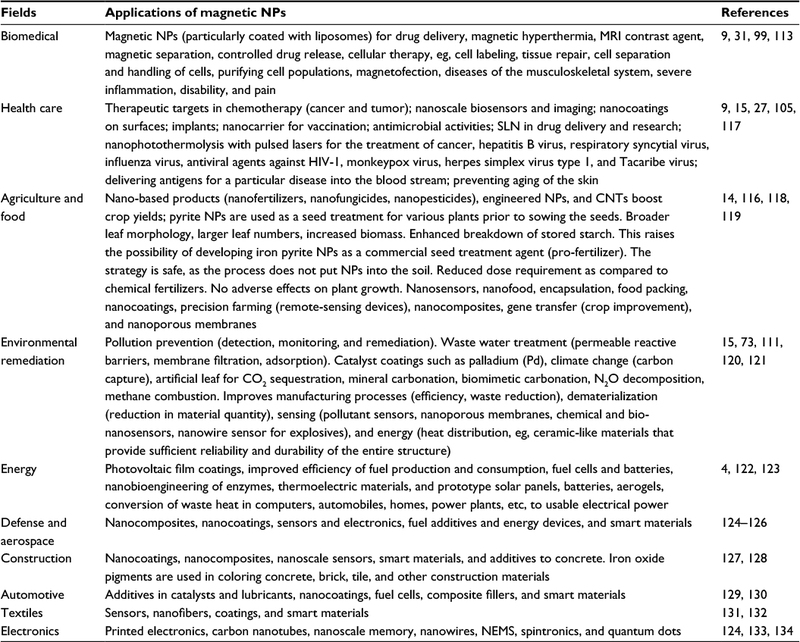 Nontoxic conduct and biocompatible applications of magnetic NPs can be enriched further by special surface coating with organic or inorganic molecules, including surfactants, drugs, proteins, starches, enzymes, antibodies, nucleotides, nonionic detergents, and polyelectrolytes. Magnetic NPs can also be directed to an organ, tissue, or tumor using an external magnetic field for hyperthermic treatment of patients. Keeping in mind the current interest in iron NPs, this review is designed to report recent information from synthesis to characterization, and applications of iron NPs. Physical methods: these are elaborate procedures which suffer from the inability to control the size of particles22 in the nanometer range. Figure 1 A comparison of the synthesis of SPIONs by three different routes. Abbreviations: NPs, nanoparticles; SPIONs, superparamagnetic iron oxide NPs. Abbreviations: NPs, nanoparticles; S #, serial number. Several synthesis routes to achieve shape, size, crystallinity, dispersity, and magnetic behavior have been developed.7 Some of them are discussed in Figure 1. The three most important published routes or procedures for the synthesis of iron oxide magnetic NPs are represented in Figure 1. This method revolves around hydroxylation and condensation of molecular precursors in solution. Obtained “sol” from nanometric particles is then dried or ‘‘gelled’’ either by solvent removal or by chemical reaction to obtain three-dimensional metal oxide network. The solvent used is water, but the precursors can be hydrolyzed using an acid or a base. Basic catalysis yields a colloidal gel, whereas acid catalysis formulates a polymeric gel.50 The reaction is performed at room temperature; however, heat treatment is required to obtain the final crystalline state.51 Equation 3 shows the reaction mechanism of magnetite particle formation from an aqueous iron(III) solution by sol–gel system. The parameters influencing synthesis are pH, nature, and concentration of salt precursor, kinetics, temperature, agitation, and properties of gel.52 Magnetic ordering in this procedure depends on the volume and phase of solvent but is sensitive to dispersion and size distribution.45 The associated advantages include synthesis of materials with a predetermined structure, pure amorphous phase, monodispersity, good control of particle size, control of microstructure, homogeneity of the products, and chances to generate embed molecules, which maintain their stability and properties within the matrix.7 It is an easy method for the production of metal oxides from salts at specific conditions. Polyols method is a significant technique for the preparation of well-defined NPs with controlled shape and size.59 After controlling the kinetics of the precipitation, non-agglomerated metal particles with well-defined shape and size can be obtained. The average size of the metal particles is controlled by reactive medium, heterogeneous nucleation. The synthesis steps are independent of resulting uniform particle size. Iron NPs of 100 nm can be obtained by ferrous hydroxide in organic media.60 The solvents used, such as polyols and polyethylene glycol, offer interesting properties due to their high dielectric constants. These solvents can dissolve inorganic compounds, and due to their relatively high boiling points they offer a wide operating temperature range (from 25°C to the boiling point).61 Polyols function as both reducing and stabilizing agents to control particle growth. These also prevent the aggregation of NPs.61 Type of polyols, salt ratio, concentration, and other physiological conditions affect growth , shape, size, and yield of the particles. The yield and size of Fe particles are found to be dependent upon the reduction potential of the polyols. Figure 2 Flowchart of sonochemical synthesis of iron oxide. Microwave chemistry has gained much attention in recent years, as it has been used in preparative chemistry and material synthesis since 1986.68 The shorter crystallization time and homogeneous nucleation due to uniform heat of microwave oven are major disadvantages of this system. Kijima et al68 reported that the synthesis of ultrafine α-Fe2O3 NPs with an extremely narrow distribution by microwave heating resulted in significantly high electrochemical performance due to uniformity and size.69 Most primary particles had ellipsoid shapes and were connected to each other. The average diameter of these primary particles was <10 nm with single crystals confined by electron diffraction pattern. Parsons et al69 also reported the synthesis of iron oxide/oxyhydroxide NPs by microwave ovens. The controlled growth and structure of NPs are usually due to slow reaction of the reactants (iron salt and sodium hydroxide). Iron NPs are extremely reactive with oxidizing agents, particularly with air.2 For the complete and permanent protection from oxidizing, each NP is covered with a thin covering that has little or no impact on the magnetic property of NPs, different coating materials are used for this purpose, ie, gold and silica, but these coatings weaken the magnetic properties.23 Magnesium coating is also used, which has little effect on magnetic properties of iron particles. However, the produced material is not simple; iron nanoparticles are submerged within submicrometer magnesium particles.70 The most convenient method for the production of almost fully magnetic iron particles protected from oxidation is the coating of iron carbide; however, the resulting particles are greater in size (20–100 nm), polydisperse, and ferromagnetic, so are not ideal. Even so, this represents real progress.71 Air-stable cobalt NPs are synthesized by the decomposition of cobalt carbonyl in the presence of aluminum alkyls. Iron carbonyl synthesized in same manner produced meaningful results.2 Iron oxide NMs have great importance because of their magnetic properties and wide applications. 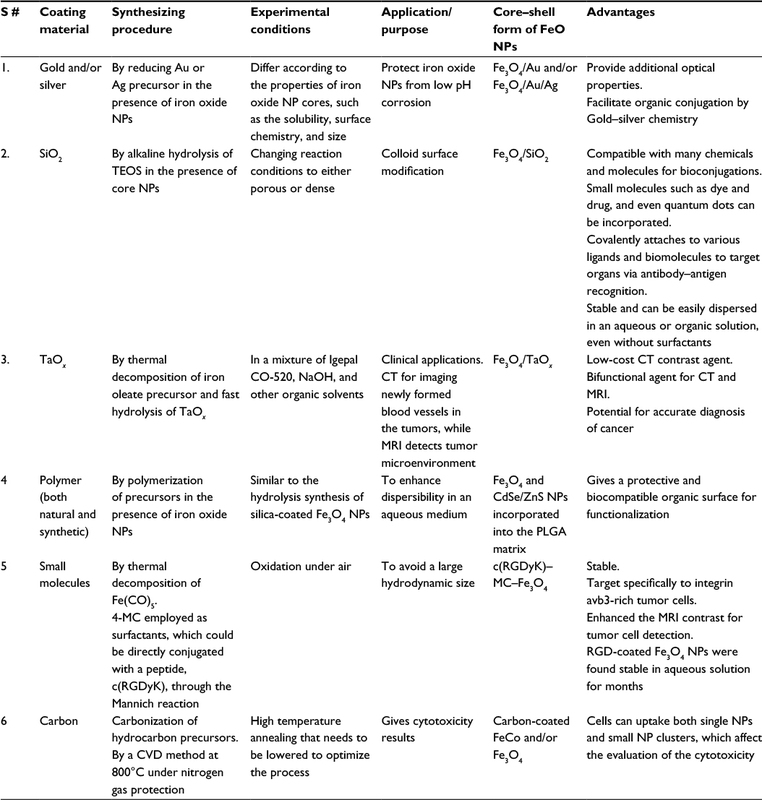 The correlation among numerous characteristic features of magnetic NPs prepared through different approaches is shown in Table 2. Abbreviation: NPs, nanoparticles; PEG, polyethylene glycol; polyNIPAAM, poly(N-isopropylacrylamide); PVA, polyvinyl alcohol; PVP, polyvinyl pyrrolidone. Note: Also shows some chemical and physical functions for their specific applications. Abbreviations: CVD, chemical vapor deposition; CT, computed tomography; 4-MC, 4-methylcatechol; MRI, magnetic resonance imaging; NPs, nanoparticles; PLGA, poly(lactic-co-glycolic acid); RGD, arginylglycylaspartic acid; TEOS, tetraethyl orthosilicate; S #, serial number. For a better understanding of surface properties, comprehensive surface characterization techniques are used such as surface morphology, chemical composition, and spatial distribution of the functional groups.102 Fundamental techniques employed to investigate magnetic NPs include: X-ray diffraction analysis, Fourier transform infrared spectroscopy, TEM, SEM, atomic force microscopy, X-ray photoelectron spectroscopy, vibrating sample magnetometry, and thermal gravimetric analysis.10 Other characterization techniques include ion–particle probe, thermodynamic, NP tracking analysis, tilted laser microscopy, zeta-potential measurements, isopycnic centrifugation, hydrophobic interaction chromatography, field-flow fractionation, electrophoresis, and turbidimetry.103,104 Detailed properties, successfulness, and restrictions of each technique are summarized in Table 6. Abbreviations: AFM, atomic force microscopy; ATR, attenuated total reflection; CD, circular dichroism; 3D, three dimension; DLS, dynamic light scattering; ESEM, environmental SEM; FCS, fluorescence correlation spectroscopy; FTIR, Fourier transform infrared; IR, infrared; MS, mass spectroscopy; NM, nanomaterial; NMR, nuclear magnetic resonance; NPs, nanoparticles; NSOM, near-field scanning optical microscopy; RS, Raman scattering; SAXS, small-angle X-ray scattering; SEM, scanning electron microscopy; SERS, surface-enhanced Raman scattering; STM, scanning tunneling microscopy; TEM, transmission electron microscopy; TERS, tip-enhanced Raman spectroscopy; XRD, X-ray diffraction analysis. Size of NPs, ie, small size gives a high surface-area-to-volume ratio that enables interaction with various types of chemical species, both aqueous and gaseous.106 The materials at nanoscale are potentially highly efficient for binding metal ions. Controlled shape, nucleation, growth, durability, reproducibility, scalability, dispersibility (particularly for building complex magnetic nanostructures).7,37,105,107 For example, the activation of iron oxide by changing its particle shape to expose its most active catalytic site could produce efficient and cheap catalysts for several reactions. Iron oxide NPs due to their strong magnetic properties were used first in biology and then in medicine for the magnetic separation of biological products and cells as well as magnetic guidance of particle systems for site-specific drug delivery.72,115 The surface chemistry, size, and charge of magnetic particles influence biodistribution of the NPs.11 Activities in the clinical applications, in the past decades, of magnetic carriers and particles are increasing due to their role in diagnostics and treatment modalities.83 Magnetic NPs have attracted much interest as a labeling material in life sciences and various other major fields of the scientific world.116 Some well-known fields with the possible applications of magnetic NMs are summarized in Table 7. Abbreviations: CNTs, carbon nanotubes; MRI, magnetic resonance imaging; NEMS, nanoelectromechanical systems; NPs, nanoparticles; SLN, solid lipid NPs. Figure 3 General pathway showing metabolism, transport, and biodegradation of iron oxide NPs. NP levels along with biodistribution data show that both kidney and liver are involved in NP elimination (Figure 3). Recently, it has been reported that after 6 hours of injection >50% of iron is found in liver.79 These studies suggest the involvement of reticular endothelial system in the clearance of NPs and major problem in biomedical application of these particles.137 Higher vascularization and permeability of iron NPs are responsible for their uptake by reticular endothelial system140 and macrophage. Opsonization is one of the important processes for the elimination of magnetic NPs from circulation through liver macrophages.141,142 In different studies, magnetic NP accumulation has also been reported in lungs due to vascularized and monocyte-rich nature.137 Chaves et al143 reported the accumulation of magnetic NPs in the lungs of mice for up to 3 months and found no associated toxicity. Normally the human body contains: hemoglobin protein, myoglobin, transferrin, and ferritin at 65%, 4%, 0.1%, and 15%–30% of magnetic NPs, respectively. It is believed that the degradation of iron oxide NPs occurs similarly like ferritins at molecular level.137 The degradation of iron NPs leads to increase in the iron level in the organs. Iron level is regulated by two main iron–protein complexes, ferritin and transferrin, which are involved in storing and shuttling of iron ions.144 Nissim and Robson145 and Richter146 are the founding researchers who reported the in vivo biodegradation of iron oxide particles along with the role of ferritin and transferrin in the biodistribution of degradation products. Mononuclear phagocytic system degrades the intravenously administered NP (>15 nm). Hemosiderin and ferritin generate iron–protein complexes. Transferrin can also be generated from ferritin and transported to bone marrow as a precursor of hemoglobin. Myoglobin is also an important iron–protein complex involved in oxygen transport in the muscle. Insubstantial and aged red blood cells burst in the spleen and release hemoglobin that results in enrichment of iron content. Macrophages metabolize hemoglobin into ferritin that is stored in hepatocytes or converted to transferrin used in the synthesis of red blood cells. Nanotechnology is the science that involves the control of atoms and molecules to create new materials with a variety of useful functions, including many that could be exceptionally beneficial in many fields.147 The basic challenges fronting in the fabrication of convenient NPs for biologics include the means to achieve monodispersity, controlled shape and size, reproducibility, scalability, and building complex nanostructures.107 NMs are very costly to produce as compared to more traditional materials, but greater quantities are produced, and according to normal economic principles their unit cost of production can be decreased, hence their price decreases.148 Since the properties of NPs are not easily understood and predicted, there are some concerns associated with human beings and agriculture which are given in Table 8. Abbreviations: CeO, cerium oxide; MRI, magnetic resonance imaging; NM, nanomaterial; NPs, nanoparticles. Substantial progress has been made in the synthesis of monodisperse iron oxide NPs for application in nanobiotechnology. Various facile methods are in the progress of rapid development, offering different kinds of monodispersed spherical nanocrystals with controllable particle sizes, compositions, shape, and magnetic properties. Owing to the biological environment, iron oxide soluble in an aqueous solution and in colloidal form is the main consideration when selecting synthesis methods. So the wet-chemical methods, such as coprecipitation and thermal decomposition of organometallic precursors, satisfy this requirement. Although coprecipitation can make water-soluble iron oxide NPs directly, the slow crystallization and the lack of size control restrict its use. A shortcoming of iron oxide NPs is their hydrophobic surface chemistry, which makes them merely soluble in nonpolar solvents such as toluene and hexane. Much effort in the past few years has been made in altering iron oxide NP surface chemistry to hydrophilic and biocompatible. A major challenge for all the methods is the design of magnetic NPs with effective surface coatings that provide optimum performance in in vitro and in vivo biological applications. Typical surface modification techniques of various kinds are summarized, including noble polymer coating, small molecular coating, silica coating, metal coating, and liposome coating. Further challenges include toxicity, scale-up, and safety of large-scale particle production processes. Monolayer polymer coating and organic ligand coating have successfully been converted hydrophobic nature into water soluble and biocompatible. Other than this, iron NPs coated with other biomolecules have enhanced their biocompatibility gaining them approval by authorities such as the US Food and Drug Administration. Therefore, the iron NPs are routinely used in the fields of MRI, target-specific drug delivery, gene therapy, cancer treatments, in vitro diagnostics, and many more. Although magnetic NPs exhibit many distinctive properties, more toxicological research is needed and the criteria to evaluate toxicity should be clearly defined. The use of better and faster methods to develop our understanding of NP toxicity will advance the field. Moreover, the biocompatibility of iron NPs is linked with toxicity and biodegradation capability and this situation varies when surface is modified with other molecules which off course will effect biodistribution and bioaccumulation. The successful engineering of multifunctional NPs would be of particular interest for the development of theranostic nanomedicine. However, the challenge remains in the clinical translation of NP probes and in issues such as biocompatibility, toxicity, and in vivo and in vitro targeting efficiency. Salata OV. Applications of nanoparticles in biology and medicine. J Nanobiotechnology. 2004;2(1):3. Huber DL. Synthesis, properties, and applications of iron nanoparticles. Small. 2005;1(5):482–501. Cornell RM, Schwertmann U. The Iron Oxides: Structure, Properties, Reactions, Occurrences and Uses. 2nd ed. John Wiley & Sons; 2006. Laurent S, Forge D, Port M, et al. Magnetic iron oxide nanoparticles: synthesis, stabilization, vectorization, physicochemical characterizations, and biological applications. Chem Rev. 2008;108(6):2064–2110. Teja AS, Koh P-Y. Synthesis, properties, and applications of magnetic iron oxide nanoparticles. Prog Crystal Growth Char Mat. 2009;55(1):22–45. De Cuyper M, Joniau M. Magnetoliposomes. Eur Biophys J. 1988;15(5):311–319. Hasany S, Ahmed I, Rajan J, Rehman A. Systematic review of the preparation techniques of iron oxide magnetic nanoparticles. Nanosci Nanotechnol. 2012;2(6):148–158. Wang C-T, Ro S-H. Nanocluster iron oxide-silica aerogel catalysts for methanol partial oxidation. Appl Catal A Gen. 2005;285(1):196–204. Gupta AK, Gupta M. Synthesis and surface engineering of iron oxide nanoparticles for biomedical applications. Biomaterials. 2005;26(18):3995–4021. Xu J, Sun J, Wang Y, Sheng J, Wang F, Sun M. Application of iron magnetic nanoparticles in protein immobilization. Molecules. 2014;19(8):11465–11486. Fortin JP, Wilhelm C, Servais J, Ménager C, Bacri JC, Gazeau F. Size-sorted anionic iron oxide nanomagnets as colloidal mediators for magnetic hyperthermia. J Am Chem Soc. 2007;129(9):2628–2635. Naseem T, Farrukh MA. Antibacterial activity of green synthesis of iron nanoparticles using Lawsonia inermis and Gardenia jasminoides leaves extract. J Chem. 2015;2015:7. Sheng-Nan S, Chao W, Zan-Zan Z, et al. Magnetic iron oxide nanoparticles: synthesis and surface coating techniques for biomedical applications. Chinese Phys B. 2014;23(3):037503. Siddiqui MH, Al-Whaibi MH, Sakran AM, et al. Calcium-induced amelioration of boron toxicity in radish. J Plant Growth Regul. 2013;32(1):61–71. Auffan M, Rose J, Bottero JY, Lowry GV, Jolivet JP, Wiesner MR. Towards a definition of inorganic nanoparticles from an environmental, health and safety perspective. Nat Nanotechnol. 2009;4(10):634–641. Khodakovskaya MV, de Silva K, Nedosekin DA, et al. Complex genetic, photothermal, and photoacoustic analysis of nanoparticle-plant interactions. Proceedings of the National Academy of Sciences. 2011;108(3):1028–1033. Allen M, Willits D, Mosolf J, Young M, Douglas T. Protein cage constrained synthesis of ferrimagnetic iron oxide nanoparticles. Adv Mater Deerfield. 2002;14(21):1562–1565. Feizi H, Rezvani Moghaddam P, Shahtahmassebi N, Fotovat A. Impact of bulk and nanosized titanium dioxide (TiO2) on wheat seed germination and seedling growth. Biol Trace Elem Res. 2012;146(1):101–106. Ma Y, Kuang L, He X, et al. Effects of rare earth oxide nanoparticles on root elongation of plants. Chemosphere. 2010;78(3):273–279. Luborsky F. The kinetics of growth of spherical iron crystallites in mercury. J Phys Chem. 1957;61(10):1336–1340. Collier J, Messersmith P. Biomimetic mineralization, mesoporous structures. In Encyclopedia Mater Sci Technol. Elsevier. 2001:602–606. Cuenya BR. Synthesis and catalytic properties of metal nanoparticles: size, shape, support, composition, and oxidation state effects. Thin Solid Films. 2010;518(12):3127–3150. Wu W, He Q, Jiang C. Magnetic iron oxide nanoparticles: synthesis and surface functionalization strategies. ChemInform. 2009;40(24):i.
Wu S, Sun A, Zhai F, et al. Fe3 O4 magnetic nanoparticles synthesis from tailings by ultrasonic chemical co-precipitation. Mat Lett. 2011;65(12):1882–1884. Maity D, Agrawal D. Synthesis of iron oxide nanoparticles under oxidizing environment and their stabilization in aqueous and non-aqueous media. J Magn Magn Mater. 2007;308(1):46–55. Soenen SJ, Himmelreich U, Nuytten N, Pisanic TR 2nd, Ferrari A, De Cuyper M. Intracellular nanoparticle coating stability determines nanoparticle diagnostics efficacy and cell functionality. Small. 2010;6(19):2136–2145. ElBayoumi TA, Torchilin VP, Weissig V. Liposomes: Methods and Protocols, Volume 1: Pharmaceutical Nanocarriers. 2010. Xu J, Yang H, Fu W, et al. Preparation and magnetic properties of magnetite nanoparticles by sol–gel method. J Magn Magn Mater. 2007;309(2):307–311. Lin X-M, Samia AC. Synthesis, assembly and physical properties of magnetic nanoparticles. J Magn Magn Mater. 2006;305(1):100–109. Soenen SJ, Brisson AR, De Cuyper M. Addressing the problem of cationic lipid-mediated toxicity: the magnetoliposome model. Biomaterials. 2009;30(22):3691–3701. Woo K, Hong J, Choi S, et al. Easy synthesis and magnetic properties of iron oxide nanoparticles. Chem Mat. 2004;16(14):2814–2818. Salazar-Alvarez G, Muhammed M, Zagorodni AA. Novel flow injection synthesis of iron oxide nanoparticles with narrow size distribution. Chem Eng Sci. 2006;61(14):4625–4633. Ling D, Hyeon T. Chemical design of biocompatible iron oxide nanoparticles for medical applications. Small. 2013;9(9–10):1450–1466. Unsoy G, Yalcin S, Khodadust R, Gunduz G, Gunduz U. Synthesis optimization and characterization of chitosan-coated iron oxide nanoparticles produced for biomedical applications. J Nanopart Res. 2012;14(11):1–13. Thorek DL, Chen AK, Czupryna J, Tsourkas A. Superparamagnetic iron oxide nanoparticle probes for molecular imaging. Ann Biomed Eng. 2006;34(1):23–38. Jolivet J-P, Henry M, Livage J. Metal Oxide Chemistry and Synthesis: From Solution to Solid State. Wiley-Blackwell; 2000. Kim D, Zhang Y, Voit W, Rao KV, Muhammed M. Synthesis and characterization of surfactant-coated superparamagnetic monodispersed iron oxide nanoparticles. J Magn Magn Mater. 2001;225(1):30–36. Kim DK, Mikhaylova M, Zhang Y, Muhammed M. Protective coating of superparamagnetic iron oxide nanoparticles. Chem Mat. 2003;15(8):1617–1627. Mohapatra S, Misra M, Mahajan VK, Raja KS. A novel method for the synthesis of titania nanotubes using sonoelectrochemical method and its application for photoelectrochemical splitting of water. J Catal. 2007;246(2):362–369. Cornell RM, Schwertmann U. The Iron Oxides: Structure, Properties, Reactions, Occurrences and Uses. 1st ed. John Wiley & Sons; 2003. Massart R. Preparation of aqueous magnetic liquids in alkaline and acidic media. IEEE Trans Magn. 1981;17(2):1247–1248. Massart R, Cabuil V. Effect of some parameters on the formation of colloidal magnetite in alkaline-medium-yield and particle-size control. J de Chimie Physique et de Physico-Chimie Biologique. 1987;84(7–8):967–973. Tavakoli A, Sohrabi M, Kargari A. A review of methods for synthesis of nanostructured metals with emphasis on iron compounds. Chem Papers. 2007;61(3):151–170. Pileni M. Reverse micelles as microreactors. J Phys Chem. 1993;97(27):6961–6973. Salazar Alvarez G. Synthesis, Characterisation and Applications of Iron Oxide Nanoparticles. 2004. Soenen SJ, De Cuyper M. Assessing cytotoxicity of (iron oxide-based) nanoparticles: an overview of different methods exemplified with cationic magnetoliposomes. Contrast Media Mol Imaging. 2009;4(5):207–219. Tartaj P, del Puerto Morales M, Veintemillas-Verdaguer S, González-Carreño T, Serna CJ. The preparation of magnetic nanoparticles for applications in biomedicine. J Phys D Appl Phys. 2003;36(13):R182. Lam UT, Mammucari R, Suzuki K, Foster NR. 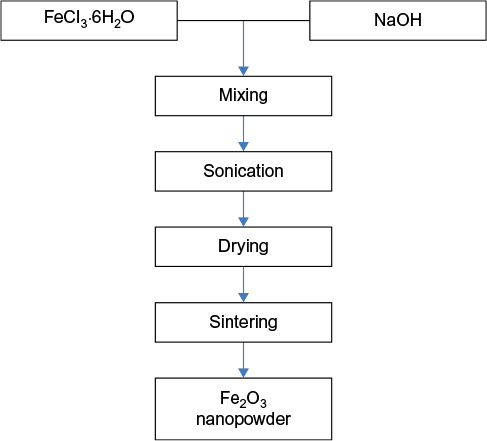 Processing of iron oxide nanoparticles by supercritical fluids. Ind Eng Chem Res. 2008;47(3):599–614. Kojima K, Miyazaki M, Mizukami F, Maeda K. Selective formation of spinel iron oxide in thin films by complexing agent-assisted sol-gel processing. J Sol-Gel Sci Technol. 1997;8(1–3):77–81. Ennas G, Musinu A, Piccaluga G, et al. Characterization of iron oxide nanoparticles in an Fe2O3-SiO2 composite prepared by a sol-gel method. Chem Mat. 1998;10(2):495–502. Tadić M, Marković D, Spasojević V, et al. Synthesis and magnetic properties of concentrated α-Fe 2 O 3 nanoparticles in a silica matrix. J Alloys Comp. 2007;441(1):291–296. Hasany F, Abdurahman NH, Sunarti AR, Jose R. Magnetic iron oxide nanoparticles: chemical synthesis and applications review. Curr Nanosci. 2013;9(5):561–575. Gonzalez-Carreno T, Morales MP, Gracia M, Serna CJ. Preparation of uniform γ-Fe 2 O 3 particles with nanometer size by spray pyrolysis. Mater Lett. 1993;18(3):151–155. Dumitrache F, Morjan I, Alexandreseu R, et al. Iron–iron oxide core–shell nanoparticles synthesized by laser pyrolysis followed by superficial oxidation. Appl Surf Sci. 2005;247(1):25–31. Tartaj P, Morales MP, Gonzalez-Carreno T, et al. Advances in magnetic nanoparticles for biotechnology applications. J Magn Magn Mater. 2005;290:28–34. Kumfer BM, Shinoda K, Jeyadevan B, Kennedy IM. Gas-phase flame synthesis and properties of magnetic iron oxide nanoparticles with reduced oxidation state. J Aerosol Sci. 2010;41(3):257–265. Fievet F, Lagier JP, Blin B, Beaudoin B, Figlarz M. Homogeneous and heterogeneous nucleations in the polyol process for the preparation of micron and submicron size metal particles. Solid State Ionics. 1989;32:198–205. Jezequel D, Guenot J, Jouini N, et al. Submicrometer zinc oxide particles: Elaboration in polyol medium and morphological characteristics. J Mater Res. 1995;10(01):77–83. Joseyphus RJ, Shinoda K, Kodama D, Jeyadevan B. Size controlled Fe nanoparticles through polyol process and their magnetic properties. Mater Chem Phys. 2010;123(2):487–493. Hao Y, Teja AS. Continuous hydrothermal crystallization of α–Fe 2 O 3 and Co 3 O 4 nanoparticles. J Mater Res. 2003;18(02):415–422. Xu C, Lee J, Teja AS. Continuous hydrothermal synthesis of lithium iron phosphate particles in subcritical and supercritical water. J Supercrit Fluids. 2008;44(1):92–97. Hassanjani-Roshan A, Reza Vaezi M, Shokuhfar A, Rajabali Z. Synthesis of iron oxide nanoparticles via sonochemical method and their characterization. Particuology. 2011;9(1):95–99. Ashokkumar M, Lee J, Kentish S, Grieser F. Bubbles in an acoustic field: an overview. Ultrason Sonochem. 2007;14(4):470–475. Wang XK, Chen GH, Guo WL. Sonochemical degradation kinetics of methyl violet in aqueous solutions. Molecules. 2003;8(1):40–44. Pinkas J, Reichlova V, Zboril R, Moravec Z, Bezdicka P, Matejkova J. Sonochemical synthesis of amorphous nanoscopic iron(III) oxide from Fe(acac)3. Ultrason Sonochem. 2008;15(3):257–264. Kijima N, Yoshinaga M, Awaka J, Akimoto J. Microwave synthesis, characterization, and electrochemical properties of α-Fe 2 O 3 nanoparticles. Solid State Ionics. 2011;192(1):293–297. Parsons J, Luna C, Botez CE, Elizalde J, Gardea-Torresdey JL. Microwave-assisted synthesis of iron (III) oxyhydroxides/oxides characterized using transmission electron microscopy, X-ray diffraction, and X-ray absorption spectroscopy. J Phys Chem Solids. 2009;70(3):555–560. Mahmoudi M, Simchi A, Imani M, Hafeli UO. Superparamagnetic iron oxide nanoparticles with rigid cross-linked polyethylene glycol fumarate coating for application in imaging and drug delivery. J Phys Chem C. 2009;113(19):8124–8131. Ittrich H, Peldschus K, Raabe N, Kaul M, Adam G. Superparamagnetic iron oxide nanoparticles in biomedicine: applications and developments in diagnostics and therapy. Rofo. 2013;185(12):1149–1166. Estelrich J, Escribano E, Queralt J, Busquets MA. Iron oxide nanoparticles for magnetically-guided and magnetically-responsive drug delivery. Int J Mol Sci. 2015;16(4):8070–8101. Xu P, Zeng GM, Huang DL, et al. Use of iron oxide nanomaterials in wastewater treatment: a review. Science of the Total Environment. 2012;424:1–10. Amendola V, Riello P, Meneghetti M. Magnetic nanoparticles of iron carbide, iron oxide, iron@ iron oxide, and metal iron synthesized by laser ablation in organic solvents. J Phys Chem C. 2010;115(12):5140–5146. Dadashi S, Poursalehi R, Delavari H. Structural and optical properties of pure iron and iron oxide nanoparticles prepared via pulsed Nd: YAG laser ablation in liquid. Procedia Mater Sci. 2015;11:722–726. Lu Y, Yin Y, Mayers BT, Xia Y. Modifying the surface properties of superparamagnetic iron oxide nanoparticles through a sol-gel approach. Nano Lett. 2002;2(3):183–186. Sun Y-P, Lia X-Q, Zhanga W-X, Wang HP. A method for the preparation of stable dispersion of zero-valent iron nanoparticles. Coll Surfaces A Physicochem Eng Aspects. 2007;308(1):60–66. Xia T, Wang J, Wu C, et al. Novel complex-coprecipitation route to form high quality triethanolamine-coated Fe 3 O 4 nanocrystals: their high saturation magnetizations and excellent water treatment properties. CrystEngComm. 2012;14(18):5741–5744. Jain TK, Reddy MK, Morales MA, Leslie-Pelecky DL, Labhasetwar V. Biodistribution, clearance, and biocompatibility of iron oxide magnetic nanoparticles in rats. Mol Pharm. 2008;5(2):316–327. Hui C, Shen C, Tian J, et al. Core-shell Fe 3 O 4@ SiO 2 nanoparticles synthesized with well-dispersed hydrophilic Fe 3 O 4 seeds. Nanoscale. 2011;3(2):701–705. Petcharoen K, Sirivat A. Synthesis and characterization of magnetite nanoparticles via the chemical co-precipitation method. Mater Sci Eng B. 2012;177(5):421–427. Dozier D, Palchoudhury S, Bao Y. Synthesis of iron oxide nanoparticles with biological coatings. J Sci Health Univ Alabama. 2010;7:16–18. Mahdavi M, Ahmad MB, Haron MJ, et al. Synthesis, surface modification and characterisation of biocompatible magnetic iron oxide nanoparticles for biomedical applications. Molecules. 2013;18(7):7533–7548. Hamley IW. Nanotechnology with soft materials. Angew Chem Int Ed Engl. 2003;42(15):1692–1712. Tepper T, Ilievski F, Ross CA, et al. Magneto-optical properties of iron oxide films. J Appl Phys. 2003;93(10):6948–6950. Ghosh S, Jiang W, McClements JD, Xing B. Colloidal stability of magnetic iron oxide nanoparticles: influence of natural organic matter and synthetic polyelectrolytes. Langmuir. 2011;27(13):8036–8043. Kango S, Kalia S, Celli A, Njuguna J, Habibi Y, Kumar R. Surface modification of inorganic nanoparticles for development of organic–inorganic nanocomposites – a review. Prog Polym Sci. 2013;38(8):1232–1261. Castelló J, Gallardo M, Busquets MA, Estelrich J. Chitosan (or alginate)-coated iron oxide nanoparticles: a comparative study. Coll Surfaces A Physicochem Eng Aspects. 2015;468:151–158. Massia SP, Stark J, Letbetter DS. Surface-immobilized dextran limits cell adhesion and spreading. Biomaterials. 2000;21(22):2253–2261. 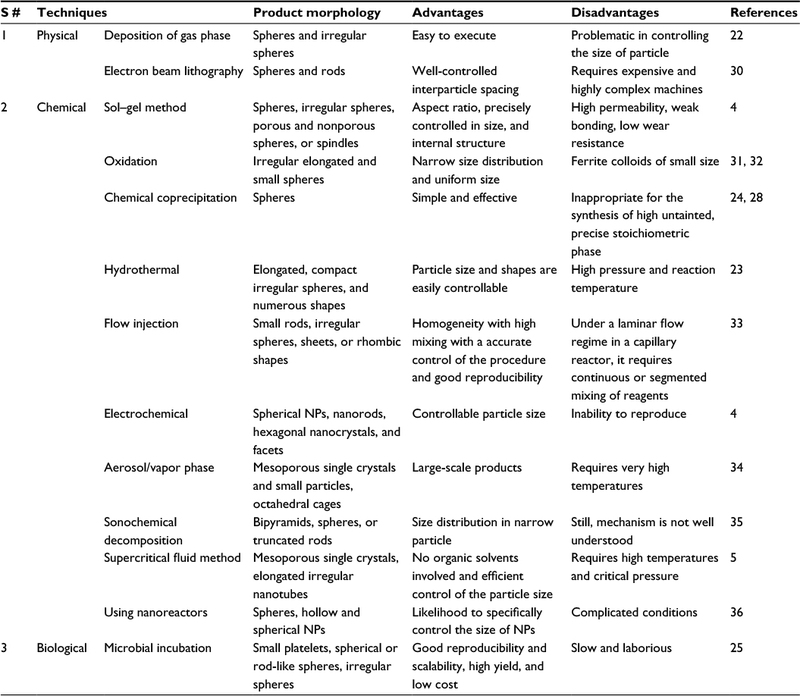 Ghosh Chaudhuri R, Paria S. Core/shell nanoparticles: classes, properties, synthesis mechanisms, characterization, and applications. Chem Rev. 2011;112(4):2373–2433. Gupta AK, Curtis AS. Surface modified superparamagnetic nanoparticles for drug delivery: interaction studies with human fibroblasts in culture. J Mater Sci Mater Med. 2004;15(4):493–496. Berry CC, Wells S, Charles S, Curtis AS. Dextran and albumin derivatised iron oxide nanoparticles: influence on fibroblasts in vitro. Biomaterials. 2003;24(25):4551–4557. D’Souza AJM, Schowen RL, Topp EM. Polyvinylpyrrolidone–drug conjugate: synthesis and release mechanism. J Control Release. 2004;94(1):91–100. Sahoo Y, Pizem H, Fried T, et al. Alkyl phosphonate/phosphate coating on magnetite nanoparticles: a comparison with fatty acids. Langmuir. 2001;17(25):7907–7911. Shan GB, Xing JM, Luo MF, Liu HZ, Chen JY. Immobilization of Pseudomonas delafieldii with magnetic polyvinyl alcohol beads and its application in biodesulfurization. Biotechnol Lett. 2003;25(23):1977–1981. Burugapalli K, Koul V, Dinda AK. Effect of composition of interpenetrating polymer network hydrogels based on poly(acrylic acid) and gelatin on tissue response: a quantitative in vivo study. J Biomed Mater Res A. 2004;68(2):210–218. Lewin M, Carlesso N, Tung CH, et al. Tat peptide-derivatized magnetic nanoparticles allow in vivo tracking and recovery of progenitor cells. Nat Biotechnol. 2000;18(4):410–414. Denizot B, Tanguy G, Hindre F, Rump E, Jacques Le Jeune J, Jallet P. Phosphorylcholine coating of iron oxide nanoparticles. J Colloid Interface Sci. 1999;209(1):66–71. Soenen SJ, Himmelreich U, Nuytten N, De Cuyper M. Cytotoxic effects of iron oxide nanoparticles and implications for safety in cell labelling. Biomaterials. 2011;32(1):195–205. Khor E, Lim LY. Implantable applications of chitin and chitosan. Biomaterials. 2003;24(13):2339–2349. Olsen D, Yang C, Bodo M, et al. Recombinant collagen and gelatin for drug delivery. Adv Drug Deliv Rev. 2003;55(12):1547–1567. Hyeon T. Chemical synthesis of magnetic nanoparticles. Chem Commun. 2003(8):927–934. Sarkar DJ, Singh A, Mandal P, Kumar A, Parmar BS. Synthesis and characterization of poly (CMC-g-cl-PAam/Zeolite) superabsorbent composites for controlled delivery of zinc micronutrient: swelling and release behavior. Polym Plast Technol Eng. 2015;54(4):357–367. Sosa IO, Noguez C, Barrera RG. Optical properties of metal nanoparticles with arbitrary shapes. J Phys Chem B. 2003;107(26):6269–6275. Mohapatra M, Anand S. Synthesis and applications of nano-structured iron oxides/hydroxides–a review. Int J Eng Sci Technol. 2010;2(8):127–146. Hiemstra T, Rahnemaie R, van Riemsdijk WH. Surface complexation of carbonate on goethite: IR spectroscopy, structure and charge distribution. J Colloid Interface Sci. 2004;278(2):282–290. Lee JH, Huh YM, Jun YW, et al. Artificially engineered magnetic nanoparticles for ultra-sensitive molecular imaging. Nat Med. 2007;13(1):95–99. Rossi LM, Costa NJS, Silva FP, Wojcieszak R. Magnetic nanomaterials in catalysis: advanced catalysts for magnetic separation and beyond. Green Chem. 2014;16(6):2906–2933. Chatterjee J, Haik Y, Chen C-J. Size dependent magnetic properties of iron oxide nanoparticles. J Magn Magn Mater. 2003;257(1):113–118. Mahmoudi M, Simchi A, Imani M, et al. A new approach for the in vitro identification of the cytotoxicity of superparamagnetic iron oxide nanoparticles. Colloids and Surfaces B: Biointerfaces. 2010;75(1):300–309. Mahmoudi M, Sant S, Wang B, Laurent S, Sen T. Superparamagnetic iron oxide nanoparticles (SPIONs): development, surface modification and applications in chemotherapy. Adv Drug Deliv Rev. 2011;63(1):24–46. Gupta AK, Naregalkar RR, Vaidya VD, Gupta M. Recent advances on surface engineering of magnetic iron oxide nanoparticles and their biomedical applications. Nanomedicine (Lond). 2007;2(1):23–39. Estelrich J, Sánchez-Martín MJ, Busquets MA. Nanoparticles in magnetic resonance imaging: from simple to dual contrast agents. Int J Nanomedicine. 2015;10:1727–1741. Guo S, Sun S. FePt nanoparticles assembled on graphene as enhanced catalyst for oxygen reduction reaction. J Am Chem Soc. 2012;134(5):2492–2495. Lemire JA, Harrison JJ, Turner RJ. 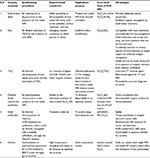 Antimicrobial activity of metals: mechanisms, molecular targets and applications. Nat Rev Microbiol. 2013;11(6):371–384. Srivastava N. Iron nanoparticles induced toxicity in Sesbania cannabina: a morphological aspect. Adv Sci Focus. 2014;2(2):135–139. Nel AE, Mädler L, Velegol D, et al. Understanding biophysicochemical interactions at the nano–bio interface. Nat Mater. 2009;8(7):543–557. Aslani F, Bagheri S, Muhd Julkapli N, Juraimi AS, Hashemi FS, Baghdadi A. Effects of engineered nanomaterials on plants growth: an overview. The Scientific World Journal. 2014;2014. Servin A, Elmer W, Mukherjee A, et al. A review of the use of engineered nanomaterials to suppress plant disease and enhance crop yield. J Nanopart Res. 2015;17(2):1–21. Zhang W-X. Nanoscale iron particles for environmental remediation: an overview. J Nanopart Res. 2003;5(3–4):323–332. Bystrzejewska-Piotrowska G, Golimowski J, Urban PL. Nanoparticles: their potential toxicity, waste and environmental management. Waste Manag. 2009;29(9):2587–2595. Zhang Y, Chen Y, Westerhoff P, Crittenden J. Impact of natural organic matter and divalent cations on the stability of aqueous nanoparticles. Water Res. 2009;43(17):4249–4257. Wang D, Kou R, Choi D, et al. Ternary self-assembly of ordered metal oxide− graphene nanocomposites for electrochemical energy storage. ACS Nano. 2010;4(3):1587–1595. Matsui I. Nanoparticles for electronic device applications: a brief review. J Chem Eng Japan. 2005;38(8):535–546. Pisanic TR 2nd, Blackwell JD, Shubayev VI, Fiñones RR, Jin S. Nanotoxicity of iron oxide nanoparticle internalization in growing neurons. Biomaterials. 2007;28(16):2572–2581. Zhu X, Zhu Y, Murali S, Stoller MD, Ruoff RS. Nanostructured reduced graphene oxide/Fe2O3 composite as a high-performance anode material for lithium ion batteries. ACS Nano. 2011;5(4):3333–3338. Foley RW, Wiek A. Scenarios of nanotechnology innovation vis-à-vis sustainability challenges. Futures. 2014;64:1–14. Smith D, Edwards JL, Edwards JL, Inventors. Concrete Admixture Device and Method of Using Same. US Patent 4,961790. 9 October 1990. Gojova A, Lee JT, Jung HS, Guo B, Barakat AI, Kennedy IM. Effect of cerium oxide nanoparticles on inflammation in vascular endothelial cells. Inhal Toxicol. 2009;21(sup1):123–130. Mayer AC, Ulrich A, Czerwinski J, Mooney JJ. Metal-Oxide Particles in Combustion Engine Exhaust. SAE Technical Paper; 2010. Ding B, Wang M, Yu J, Sun G. Gas sensors based on electrospun nanofibers. Sensors. 2009;9(3):1609–1624. Xiao S, Shen M, Guo R, Wang S, Shi X. Immobilization of zerovalent iron nanoparticles into electrospun polymer nanofibers: synthesis, characterization, and potential environmental applications. J Phys Chem C. 2009;113(42):18062–18068. Choi HC, Kundaria S, Wang D, et al. Efficient formation of iron nanoparticle catalysts on silicon oxide by hydroxylamine for carbon nanotube synthesis and electronics. Nano Lett. 2003;3(2):157–161. Lin C-R, Chiang R-K, Wang J-S, Sung T-W. Magnetic properties of monodisperse iron oxide nanoparticles. J Appl Phys. 2006;99(8):08N710. Chouly C, Pouliquen D, Lucet I, Jeune JJ, Jallet P. Development of superparamagnetic nanoparticles for MRI: effect of particle size, charge and surface nature on biodistribution. J Microencapsul. 1996;13(3):245–255. Owens DE 3rd, Peppas NA. Opsonization, biodistribution, and pharmacokinetics of polymeric nanoparticles. Int J Pharm. 2006;307(1):93–102. Edge D, Shortt CM, Gobbo OL, et al. Pharmacokinetics and bio-distribution of novel super paramagnetic iron oxide nanoparticles (SPIONs) in the anaesthetized pig. Clinical and Experimental Pharmacology and Physiology. 2016;43(3):319–326. Shanehsazzadeh S, Oghabian MA, Daha FJ, Amanlou M, Allen BJ. Biodistribution of ultra small superparamagnetic iron oxide nanoparticles in BALB mice. J Radioanal Nucl Chem. 2013;295(2):1517–1523. Oghabian MA, Farahbakhsh NM. 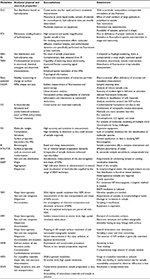 Potential use of nanoparticle based contrast agents in MRI: a molecular imaging perspective. J Biomed Nanotechnol. 2010;6(3):203–213. Hanini A, Schmitt A, Kacem K, Chau F, Ammar S, Gavard J. 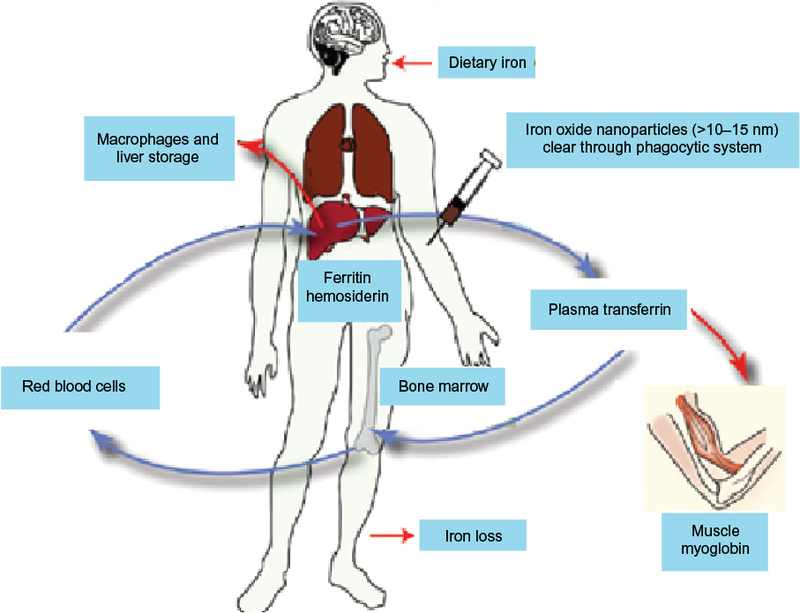 Evaluation of iron oxide nanoparticle biocompatibility. Int J Nanomedicine. 2011;6:787–794. Mejías R, Pérez-Yagüe S, Roca AG, et al. Liver and brain imaging through dimercaptosuccinic acid-coated iron oxide nanoparticles. Nanomedicine. 2010;5(3):397–408. 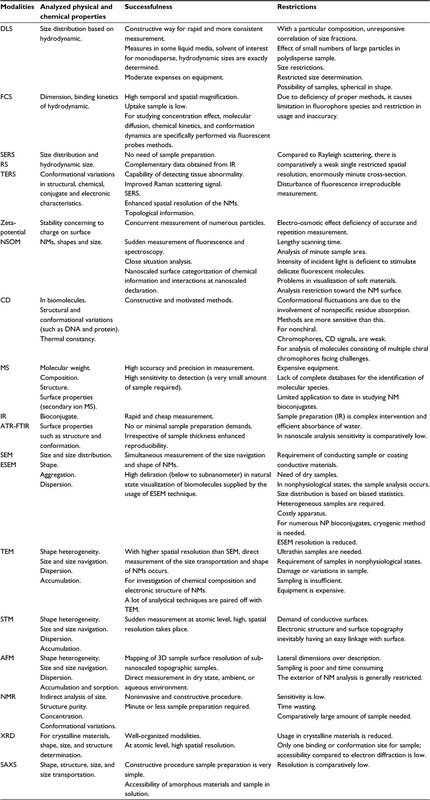 Brigger I, Dubernet C, Couvreur P. Nanoparticles in cancer therapy and diagnosis. Adv Drug Deliv Rev. 2012;64:24–36. Chaves S, Silva LP, Lacava ZGM, Morais PC, Azevedo RB. Interleukin-1 and interleukin-6 production in mice’s lungs induced by 2, 3 meso-dimercaptosuccinic-coated magnetic nanoparticles. J Appl Phys. 2005;97(10):10Q915. Nissim J, Robson J. Preparation and standardisation of saccharated iron oxide for intravenous administration. Lancet. 1949;253(6556):686–689. Richter GW. The cellular transformation of injected colloidal iron complexes into ferritin and hemosiderin in experimental animals a study with the aid of electron microscopy. J Exp Med. 1959;109(2):197–216. Roco MC, MC Hersam, Mirkin CA. Innovative and responsible governance of nanotechnology for societal development. Nanotechnology Research Directions for Societal Needs in 2020. Springer; 2011:561–617. Buzea C, Pacheco II, Robbie K. Nanomaterials and nanoparticles: sources and toxicity. Biointerphases. 2007;2(4):MR17–MR71. Silva J, Fernandes AR, Baptista PV. Application of Nanotechnology in Drug Delivery. 2014. Handy RD, Shaw BJ. Toxic effects of nanoparticles and nanomaterials: implications for public health, risk assessment and the public perception of nanotechnology. Health Risk Soc. 2007;9(2):125–144. Ryan P, Delhaize E, Jones D. Function and mechanism of organic anion exudation from plant roots. Ann Rev Plant Biol. 2001;52(1):527–560. Dinesh R, Anandaraj M, Srinivasan V, Hamza S. Engineered nanoparticles in the soil and their potential implications to microbial activity. Geoderma. 2012;173:19–27.